Blackjack game gives the dealer a certain statistical advantage over the player and since the player plays to win, he must do something to change things in his favor. Card counting is the blackjack strategy that is available to the player to use to tilt the house edge rules in his favor. Various card counting strategies have emerged over the years and they have all been proven to work albeit with some differences in degrees of certainty. The basic strategy again is to use a counting strategy which you find yourself more comfortable with to avoid getting confused in the card counting process. When the deck has more of low card numbers then the advantage is on the dealer because the player is likely to require more hits which increase the player's chances of busting. This is because the low cards are more likely to land the player on hard hands from where next hits become tricky. It is very possible that the dealer will win without any effort since a bust for the player is a win for the dealer. But when the deck is filled with high value cards then the player has greater likelihood of hitting 21 or a hand much closer to that number. Basic card counting system works best for starters and is relatively simple to use. Basic card counting strategy signs all cards values between the following three; +1, 0 and -1. This is usually much easier to remember and less confusing than other strategies which assign more numbers. The idea is to assign the various cards values ranging from +1 to -1 in such a manner that they add up to zero. It is in the process of adding such numbers that you can establish whether there are lower card numbers or high card numbers and determine your chances of hitting a blackjack and decide how to place your bets. The reason why the basic card counting system is desirable for starters is because it will help you remain focused while playing and counting your cards. 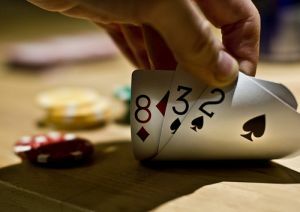 Blackjack casino does not permit players counting cards and if found then you may be penalized or be expelled. It is against the rules of the house and therefore it is important to use a system that can be done by heart. Learn how to count your cards and increase your chances of winning at blackjack.